So much for NDAs and Embargoes. It looks like an entire AMD briefing presentation for the upcoming Ryzen 2000-series has been leaked, detailing both CPU and Motherboard ranges, technical capabilities and pricing. The only relevant piece of information missing is the CPU launch dates, with only explicit reference made to an April 19th launch for 400-series motherboards that tallies with the known 'mid-April' CPU launch window. 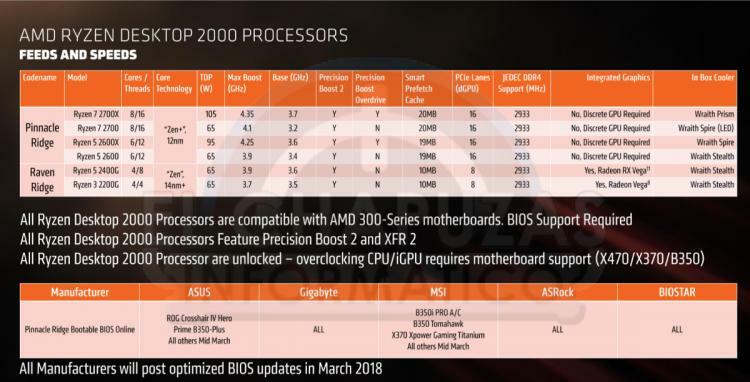 What appear to be official AMD slides for their upcoming Ryzen 2000-series have today been leaked by Italian site Elchapuzas Informatico, ahead on an on-slide NDA date of March 15th. Due to a few spelling and presentation inconsistencies it's likely that this is a relatively early draft of a presentation prior to a press briefing. We should state that we've been provided no information (embargoed or otherwise) thus far about the Ryzen 2000-series from AMD, so cannot confirm the slides' authenticity. In a surprise move Ryzen's 2000-series is set to launch with the Ryzen 7 2700X as the flagship, avoiding for now an R7 2800/2800X. 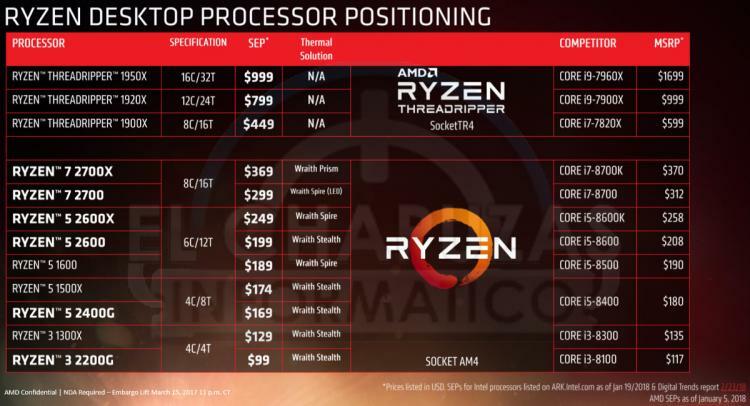 Given the popularity of the R7 1700/1700X with consumers over the 1800/1800X, it's possible that AMD deemed there was no need for a higher positioned model. The 8-core/16-thread Ryzen 7 2700X will ship with an MSRP of $369, approximately the same price as Intel's Core i7-8700K, and include a Wraith Prism cooler. Other than the flagship, the 2000-series will feature five CPUs including the two APU's launched last month. While the R7 2700 is the stop-gap $299 8-core, 16-thread model, two six-core Ryzen 5 2600 CPUs will enter at $249 and $199 respectively. Existing quad-core 1000-series models will remain in the retail channel at launch to round out AMD's Spring 2018 lineup. All models will support overclocking to a greater or lesser extent on both 300-series and 400-series motherboards. The next slide details some of the technical aspects of each new CPU. 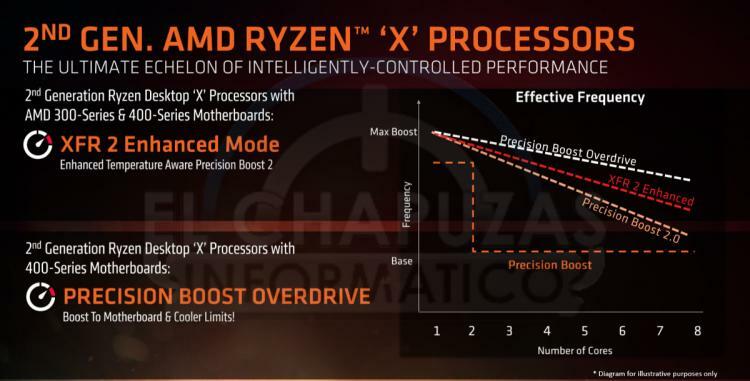 Most notably, the Ryzen 7 2700X will feature base clock speeds of 3.7GHz and boost speeds of up to 4.35GHz, generated through a new technology AMD are calling Precision Boost Overdrive unlocks higher multi-core frequencies under load. Compared to the Ryzen 7 1800X that's 100MHz higher base and 350MHz boost frequency, at the cost of 10W higher TDP. Also listed is the 6-core, 12-thread 2600 and 2600X, the later of which will clock up to 4.25GHz from 3.6GHz in a TDP envelope of 95W. Non-X CPUs (i.e. the R7 2700 and R5 2600) feature substantially reduced base and boost clocks without support for XFR2.0 or Precision Boost Overdrive, but also fit within a substantially lower 65W TDP. 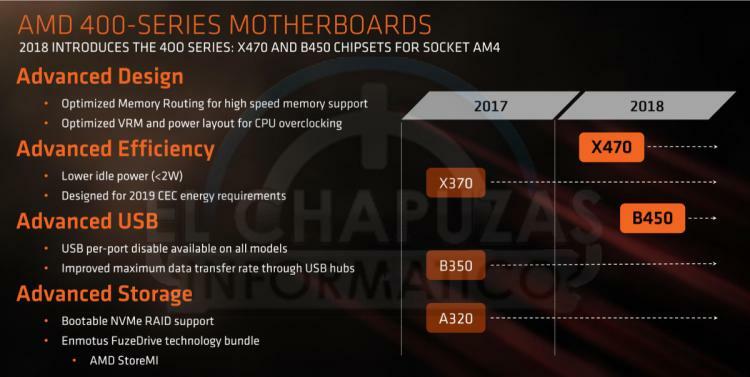 According to this slide, Pinnacle Ridge-compliant BIOS updates for in-channel 300-series AM4 motherboards will be rolled out this month by all manufacturers prior to the 2000-series launch. 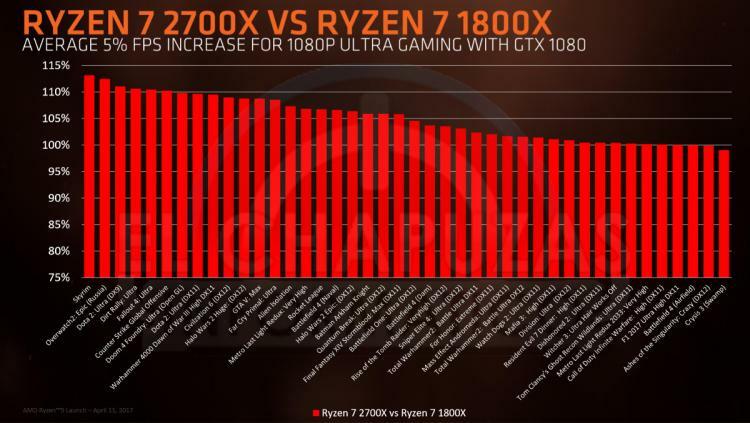 Performance-wise, specifically in gaming, AMD are projecting an ~5% improvement from R7 1800X to R7 2700X on average when measured across a wide range of games. This shouldn't be compared with previously leaked benchmark results claiming upwards of 15% performance over the prior generation, results that tested different CPUs on very different workloads. 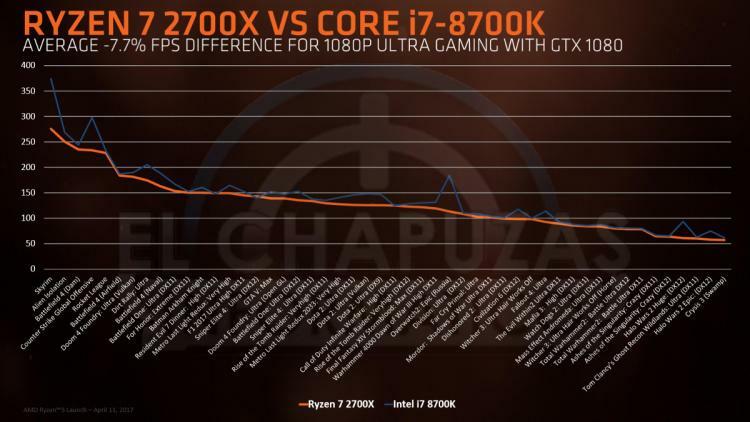 For what it's worth AMD also claim that performance for the R7 2700X was within 7% of Intel's Core i7-8700K, so it seems likely that the red team will once again be pushing ancillary productivity benefits to gamers. With both being pegged to an MSRP of ~$370, CPU price alone won't be a factor. While the new 2000-series CPUs will be officially supported by older 300-series motherboards, particular platform features will only be supported by the new 400-series. Both XFR2.0 Enhanced and Precision Boost Overdrive will require either an X470 or B450 motherboard, and hence the CPU will suffer from a performance penalty in stock configurations otherwise. The slide doesn't adequately explain the difference between XFR 2.0 Enhanced and Precision Boost Overdrive, particularly why you'd even bother with the former seeing as the latter is so much better yet has identical requirements. The launch of AMD 400-series motherboards will be staggered in 2018, with X470 coming in April and B450 released later in the year. AMD's 400-series tweaks design aspects such as memory routing and idle power consumption, while also offering support for bootable NVMe RAID out the box. The higher general costs of the X470 chipset over B450 with only marginal benefits may mean that the early adopter 'tax' for this platform is relatively high. It's unclear if this is all AMD are bringing to the table with the 2000-series launch. Gamers in particular may be disappointed with only a 5% performance improvement, but it remains to be seen if improvements in processing other workloads (such as video editing and other productivity applications) can offset such lukewarm statements. One cause for concern is the possibility that, as with Bulldozer, AMD might be juicing the CPU to achieve higher clock speeds rather than keep it within known TDP envelopes. The Ryzen 7 2700X has a 10W higher TDP than the 1800X's 95W, and it would be disappointing to see TDP creep up ever higher generationally to meet performance expectations, rather than a gradual roll out of architectural improvements. This trend will also have an impact on backwards-compatibility on the AM4 socket, although currently the 105W TDP R7 2700X should be fine on today's 300-series motherboards.